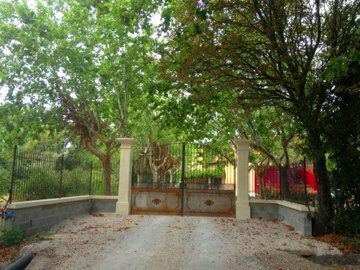 Domaine du Pegau is an old name in Chateauneuf du Pape. The Feraud family is able to trace their roots all the way back to the middle of the 17th century in the Southern Rhone Valley. That is when the ancestors of the Feraud family first planted grape vines next to their olive trees and other assorted fruit trees in Chateauneuf du Pape. The great, grandparents of Laurence Feraud were responsible for entering the family in the wine business with their initial purchases of vines. After their death, the vineyards were divided between their 4 children. It was Paul Feraud, the father of Laurence Feraud that brought Domaine Pegau into the modern age when he began to bottle his own wine from the production of a small 5 hectare parcel of vines that he inherited in Chateauneuf du Pape. Prior to that date, the production was sold to negociants. The next big step in the development of Pegau took place in 1987, when Laurence Feraud joined her father Paul Feraud at Domaine du Pegau. Under Paul Feraud and Laurence Feraud, the family were slowly able to continue increasing their vineyard holdings in size, in fact, by 1987, the family owned 7 hectares of vines. At the time, the wine was still be bottled under the name Domaine Feraud. They changed the name to Domaine du Pegau. “Pegau” is an old Provencal term for an ancient jug used for wine discovered during the excavations of the 14th century, Avignon Pope’s Palace. If you’ve wondered how to say Pegau, the daughter Laurence Feraud, who took over managing the property starting with the 2005 vintage, pronounces the name as Pay-Go. The father says it differently, Puh-Gow. That debate makes for a fun dinner conversation. In 2012, Domaine Pegau added 60 hectares of land, including 40 planted hectares of vines in the Cotes du Rhone and Cotes du Rhone Villages appellations, with the best terroir located close to Sorgues. The new wines will all be produced as coming from Chateau Pegau. Starting in 2012, they added a rose’ to their portfolio, Pink Pegau. They also introduced a new white Cotes du Rhone, Cuvee Lone with the 2012 vintage. The following year, in 2013, they changed the label for their Plan Pegau wine. The new label sports the image of a clock on the neck, with arrows pointing to different numbers, which represent the different years from which the wine was produced. As Plan Pegau is sold as a Vin de France, the wine cannot by law, list the vintage. So this is going to be a helpful and fun way to inform consumers about the wine. Starting in 2014, Domaine Pegau added a new, Chateauneuf du Pape Blanc to their portfolio, Cuvee A Tempo. Pegau Cuvee A Tempo. Domaine du Pegau owns 21 hectares of vines in Chateauneuf du Pape. 19.5 hectares are used for red wine grapes. 1.5 hectares of vines are reserved for growing white wine grapes. Due to the small size of the parcels used for the white wine grapes at Domaine Pegau, those grapes are farmed using 100% biodynamic farming techniques. The red wine grapes are not farmed biodynamically. The vineyards for Domaine du Pegau are located in different areas of Chateauneuf du Pape in a total 11 different parcels. The best vines of Domaine du Pegau are located on the plateau of La Crau. They have old vines. Their oldest vines were planted in 1902. They have a terroir of rocks, stones, clay and limestone soils. They also own 5 hectares of vines in the Cotes du Rhone appellation, 20 hectares of vines in the Cotes du Rhone Villages and 19 hectares of vines that are classified as Vin de France. The best vintages of Domaine du Pegau are: 2018, 2017, 2016, 2015, 2012, 2010, 2009, 2007, 2005, 2003, 2001, 2000, 1998, 1990 and 1989. Domaine du Pegau produces 3 red Chateauneuf du Pape wines and 2 Chateauneuf du Pape Blanc wines. Domaine du Pegau Reserve is produced from 85% Grenache, 9% Syrah and 4% Mourvedre, Counoise and other varieties. Previous vintages had a bit more Syrah in the blend. To produce the wine of Domaine Pegau reserve, the grapes are not destemmed. Only natural yeasts are used. The grapes are whole cluster fermented in traditional, cement vats. The wine is aged on average for an average of 24 months in old foudres. At Pegau, they use a wide range different old wood foudres. The oldest is close to 90 years of age and was made from wood imported from Russia. The vessels come from a myriad of regions ranging from Eastern Europe to France, they range in size from 27 hectoliters to 60 hectoliters. On average, close to 6,500 cases are produced of Domaine du Pegau each vintage. Older vintage of Pegau Reserve were often bottled at various times, due to their ability to bottle large quantities of wine at a fast pace, as well as wines could be bottled to order. Vintages from 1990 and older could have three different bottling dates that were almost one year apart. That discrepancy has created bottle variations, and there is no way to know which bottling you have. Even the 2003 vintage was bottled over a 6 month period. Today, that is not case as bottling dates have become more standardized. Domaine du Pegau Cuvee Laurence is produced from the same blend as the reservee, 85% Grenache, 9% Syrah and 4% Mourvedre, Counoise and other varieties. Previously, Cuvee Laurence was made from a specific barrel selection. Today, that is not the case. The wine is now the same as the Reserve, except it has been aged in barrel for a longer period of time. For Domaine du Pegau Cuvee Laurence is the grapes are not destemmed. The grapes are whole cluster fermented in traditional, cement vats and aged in old, French oak barrels for an average of 40 months. According to Laurence Feraud, the wine is aged to approximate what might happen with Pegau Reserve after ten years of aging. My personal preference is still for the Domaine du Pegau Reservee. On average, close to 650 cases are produced each vintage of Domaine du Pegau Cuvee Laurence. Domaine du Pegau Cuvee da Capo is one of the most expensive and in demand wines in the entire Rhone appellation! Pegau Cuvee da Capo is made from a blend of the estates oldest vine Grenache, which while it varies, as in some previous vintages it was close to about 90% of the blend. Today, the Grenache is closer to 70% of the blend, along with Syrah, Mourvedre and the remainder comes from the various 13 other red grapes that are allowed to be planted in the Chateauneuf du Pape appellation. For the wine of Pegau Cuvee da Capo, the grapes from mostly from old vines that are more than 100 years of age. The grapes are not destemmed. The wine is vinified in cement vats. Pegau Cuvee da Capo receives additional aging in old, large wood vats as the wine ages for on average between 24 to 26 months. Pegau Cuvee da Capo is only made in the best vintages. So far, Pegau Cuvee da Capo wine has only been produced in 1998, 2000, 2003, 2007 and 2010. The wine is quite high in alcohol, often over 15%, but there is never any sensation of heat. The production of Pegau Cuvee da Capo is small, with an average of 500 cases produced each vintage. Domaine du Pegau Chateauneuf du Pape Blanc is made from a blend of 60% Grenache Blanc, 20% Clairette, 10% Roussanne and 10% Bourboulenc. Aged in steel tanks, the production is close to 250 cases per year. Domaine Pegau Cuvee A Tempo is made from a blend of equal parts, Grenache Blanc, Clairette and Roussanne. The wine comes from parcels that are farmed using 100% organic farming techniques. The wine made its debut with the 2014 vintage. The wine is vinified in a combination of French oak barrels, stainless steel tanks and cement egg shaped vats. 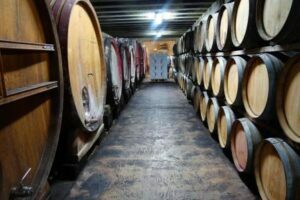 The production is quite small, with about 100 cases of wine being produced in total. For a fun fact, if you use your phone to read the barcode on the backlabel, you will hear the theme music written for the wine, that is A Tempo. Domaine du Pegau can be enjoyed on the young side, but the wine is better with age and decanting. Young vintages can be decanted for about 1 -2 or 3 hours. This allows the wine to soften and open its perfume. Older vintages might need very little decanting, just enough to remove the sediment. Domaine du Pegau is usually better with 5-7 years of bottle age. Of course that can vary slightly, depending on the vintage. In the best vintages the wine should be consumed within 7-25 years after the vintage. Domaine du Pegau is best served at 15.5 degrees Celsius, 60 degrees Fahrenheit. The cool, almost cellar temperature gives the wine more freshness and lift. Young vintages can be popped and poured, or decanted for an hour so. Cuvée du Capo can be decanted 2-3 hours. Domaine du Pegau is best served with all types of classic meat dishes, veal, pork, beef, lamb, duck, game, roast chicken, roasted, braised, grilled meats, stewed dishes, sausage, barbecue and cassoulet. Domaine du Pegau is also good with Asian dishes, hearty fish courses like tuna, mushrooms, cheese, pasta, eggplant and tomatoes. The white wine of Domaine de Pegau is best served with a myriad of different seafood dishes, shellfish, crab, lobster, sushi, sashimi, chicken, pork and veal, as well as Asian cuisine. Under the name of Chateau Pegau, the estate produces red Cotes du Rhone and white Cotes du Rhone as well as the value priced, Plan Pegau, which is sold as a Vin de Table. Laurence Feraud also entered into an agreement with Andre Brunel of Domaine Les Cailloux to produce wine from the Cotes du Rhone appellation that is sold under the name of Feraud Brunel. Pegau also produces an additional value, negociant wine, Selection Laurence Feraud. Over the years. Domaine du Pegau has also produced a few one off wines. A one off wine is a wine that is only made in a single vintage. Two unique wines were produced in honor of their children, 1995 Maxime and 1997 Justine. 1995 Domaine Pegau Cuvee Maxime and 1997 Domaine Pegau Cuvee Justine are made from a selection of the best lots, similar to what the estate does for the Cuvee da Capo. In fact, in some ways, this can be seen as a precursor to the famous Pegau Domaine da Capo. But the wines were vinified and aged using the same techniques the estate uses for the Domaine Pegau Reservee. The production is minuscule of both Maxime and Justine at close to 100 cases or less of each wine. In 2003 and 2010, Domaine Pegau also produced a special cuvee in magnum only, Pegau Inspiration. Pegau Inspiration is produced from a selection of the best barrels from their estate vineyards. Pegau Inspiration also receives a longer aging period in wood. This is similar to what the Domaine uses for the Domaine Pegau Cuvee Laurence. The production of Pegau Inspiration is extremely limited as only 240 numbered magnums are produced. Inky, dark, ruby in color, the combines insane levels of intensity with refinement and elegance. The black fruits has a surreal sense of purity. The wine is concentrated, deep and long, with peppery nuances and dark red berries in the finish. The endnote last 60 seconds. This is a remarkable wine and the best vintage of Cuvee da Capo to date. This is off the charts in all the right ways! Intense black pepper aromas start thing off. From there you quickly move to dark black cherries, olives and Provencal herbs. Deep and dark in color, the wine is rich and intense with a purity of fruit that is hard to find. With this much density, you can eat this with a spoon! The wine is full bodied and long, balanced and fresh. The dark, peppery fruits in the finish coat your palate and stay there for over more than 40 seconds building in intensity. Off the charts in the right ways! Citrus peel, crushed stone and fresh lemon aromatics lead to a silky, fresh, richly textured, lemon, grapefruit and orange marmalade filled wine that combines richness, with opulence, sweet, ripe fruit, mineralty and freshness. This is the debut vintage for this new wine from Laurence Feraud. Full bodied, spicy, fresh, peppery and already showing off its smoky, earthy, barnyard, plum, herb and kirsch profile. A few years in the cellar will help add depth, complexity and softness to this wine, allowing it to flesh and expand..
White peach, floral, citrus and orange scents, with a sweet, citrus and lively, oily, grapefruit core of fruit that will offer pleasure early. A beautiful wine in this vintage. Packed with dark, spicy red fruits and earthy, peppery charms, this is a forward styled wine for the domaine that you can enjoy while aging the delicious 2009 and 2010 vintages as they slowly work their way to maturity. Deep ruby in color, the wine pops with peppery, black raspberries, garrigue and kirsch. On the palate, the wine is full bodied, rich and deep, with a sweet, spicy, fresh, peppery character that adds to the plush textured, kirsch enriched finish. Earthy, barnyard and wild cherry scents lead to you to a rich, warm, full bodied, spicy wine that is filled with garrigue, pepper and jammy strawberries in the finish. Off the charts in the right ways! This was stunning from start to finish. The perfume explodes with scents of incredibly ripe cherries, plums, black raspberries, thyme, wet earth, garrigue and smoke. And that's just the appetizer. The main course is where the real action is, with its mouth filling, teeth staining levels of fruit, extract, the fruit is perfectly ripe, the levels of concentration are insane, yet everything is in balance. Nothing is too much. If you have the money want Chateauneuf du Pape at its best, this is worth cellaring a bottle of two. Intense, thick, rich and filled to the brim with an array of sweet, perfectly ripe, black raspberries, cherries, plum and strawberries, complicated by fresh herbs, pepper and meaty aromas. The long finish paints your mouth with flavor that really lingers. This stunning wine is at the level of the 2003, which until I tasted this bottle, was my favorite vintage of Pegau. Now, it's a tie game! Power and intensity, with luscious textures, fat, dense, ripe and very ripe red and dark red fruits, pepper and earth, with an animalistic touch. There is a lot of character to be enjoyed in this wine. Rich in color and raw materials, this stunning example of Pegau roars from the glass with its intense nose of kirsch liqueur, pepper, fennel, spice, jam and meaty nose. Deep, full-bodied and intense, the powerful wine fills your mouth and palate with layers of ripe, extremely ripe and over ripe berries. Bravo Laurence! Peppery, earthy, dark red berries are accompanied by a concentrated, thick layer of sweet, ripe fruit. There is a feeling of that is slightly drying on the palate in the finish that takes away from the wine before the finish of sweet and spicy, dark cherries kicks in. Light, early drinking, fresh, bright cherry and wild strawberry, spicy character driven wine that will be best in its youth. Peppery, jammy berries, incense, thyme and smoke on the nose. The fruit has this beautiful roasted quality. Silky, fresh, intensely concentrated and deep, with luscious, opulent textures, the wine fills your mouth, but isn’t in way, hot, or over bearing. The finish makes itself right at home on your palate as if it never wants to leave. Everything is in balance. Kirsch, cherry liqueur, black raspberry, earth and garrigue aromas, rich, lush textures and a long, fresh, pure, ripe fruit filled finish reminds me why I remain a fan of Chateauneuf du Pape and Pegau. Drink it now if you like them young, or let the wine age. This is simply delicious. Bright, peppery and filled with strawberry, fresh cherries, earth and herbs, this rich, sweet, Chateauneuf du Pape needs a few more years to come around. Krisch, garrigue, herbs, black raspberry and fresh herbal scents open to a medium bodied, fresh, acidic and still youthfully tannic Peagu. The wine needs a few more years before becoming fun to drink. This is the perfect Chateauneuf for people that find 2003 or 2007 too ripe or concentrated. Packed with ripe, spicy, meaty, dark red berries, pepper, garrigue and earth, the wine is packed with deep flavors and lusty textures, ending with a still youthful finish. Dark in color, with a nose packed with pepper, garrigue, kirsch, black raspberry, licorice and kirsch, this full bodied, concentrated, fresh, spicy, mouth filling Chateauneuf du Pape delivered the goods. Mind blowing! It took just 1 sip to knock me over, forcing me to step back, think about it, and go back for another swirl, sniff and sip. This is more than decadent. The levels of concentration here are almost impossible to believe. The wine coats your palate, teeth and gums, and the best part is, it stays there for at least 60 seconds, or longer! Yet, as much as this wine has, everything is in balance, there is just a lot of weight on both sides of the scale. Still youthful, fresh and invigorating, this should drink well for at least 2-3 more decades. But life is short, so if you have a bottle, pop a cork and enjoy the ride! Stunning in ever sense of the word, this wine has it all for Chateauneuf du Pape lovers. Waves of deep, rich, lush, ripe, sweet, spicy fruits are all over the place. There is a beauty to the fruits, symmetry, complexity and length here, with supple, hedonistic textures. This is drinking in the perfect place. I suspect this will age for quite a while, but why wait. This is exactly where it needs to be! Mouth coating, palate staining and dense, rich does not express how much weight this wine has. No shy wall flower here. The wine packs a punch from the first sniff. On the palate, this is massive, yet there is prefect, velvety symmetry to the wine, as everything is in balance and harmony. The wine owns the room, and that's OK, because it's so damn good. This is a unique expression of Chateauneuf du Pape at its best. Compelling! Each sip makes you want another, which is the sign of all great wines. The wine is incredibly concentrated, yet perfectly in balance. The fruit is perfectly ripe without heat or jammy qualities. The wine is rich, mouth coating, deep and long. 2003 Pegau da Capo has turned out so much different than I anticipated. Having tasted the wine in barrel and in bottle, I was expecting a massive, dark, jammy wine with more power than refinement. Nothing could be further from the truth. Served blind, this could have passed for a great vintage of Chateau Rayas! The beautiful fragrance was filled with earth, black cherries, kirsch, wild strawberries, pepper and spice. Elegant in texture, with a beautiful array of sweet, ripe, pure, juicy, red fruits in the finish, this suave Southern Rhone wine is a pleasure to drink now and it should remain at this level, or improve for many years to come. This is a super wine and a contender for one of my favorite vintages of Pegau. Fat, rich, dense, lush and packed with layers of perfectly ripe, red and dark red fruits, barnyard, earth, garrigue and peppery spices, this is showing great today and should continue getting even better. The wine was popped and poured. This majestic Chateauneuf du Pape gets better each time I taste it. With a perfume that pops the moment the wine hits your glass, jammy black raspberries, licorice, fresh earth, spice, kirsch and garrigue aromas are in full force. The texture is fat, lush, rich and full, ending with a long sensation of fresh, ripe, spice, dark, red berries. This wine of pleasure drinks great today. If you have some in your cellar, pop a cork and see for yourself. Beautiful nose of barnyard, pepper, kirsch liqueur, strawberry, earth and spice capture your attention. Powerful, full bodied and concentrated, this voluptuous, rich, mouth filling wine coats your palate with layers of ripe, fresh, essence of black cherry, plum, black raspberry, spice and strawberry jam. This is a knockout Chateauneuf du Pape that can be enjoyed today and based on how well the 1990 is ageing, for at least another 15-20 more years. If you're a fan of Chateauneuf du Pape, this sublime example belongs in your cellar. Explosive aromas of licorice, jammy black and red fruits, garrigue, pepper, spice, kirsch and fresh herbs. Powerful concentrated, rich, intense, pure and mouth filling. There is a lot to like with this wine. It's a fabulous expression of Chateauneuf du Pape. Inky dark in color. Ripe and over ripe blackberry, strawberry and dark cherry along with pepper, licorice and spice, the perfume demands attention. Incredible levels of concentrated ripe fruit fill your mouth with ample freshness and purity. This has great character with the ability to age and evolve. This could end up better than the 90! Barnyard scents are in full force, with this peppery, garrigue, black raspberry and earthy wine. Rich, full bodied, animalistic and filled with sweet, ripe, spicy fruit, this is drinking great today, and should be better tomorrow! Powerful, concentrated and with depth of flavor, the wine is loaded with sweet, perfectly ripe, black raspberries, kirsch, pepper and herbs, all topped off with thyme. Dense, long and lush, with a purity of fruit, this is a stunner. Drink this now, or age it for a up to another decade, either way this is just great wine. Ripe, rich, sweet, intense and in the sweet spot, there is a beautiful sensation of fruit, earth, spice, herbs and pepper that builds and expands, adding complexities to the waves of kirsch and black raspberries on your palate. A very nice, stylish Chateauneuf du Pape, but it's not delivering as much pleasure as the 2000 Pegau Reserve. Especially when you compare the price difference. It has nice aromatics, ripe fruit and a good mouth feel, but something is missing at this stage of development. Forward, jammy dark cherry and spice, this is not as good as the the previous benchmark, 1998. Fresh, balanced, complex and open, at the end of the day, it's not worth the money being asked. A massive wall of mouth-filling super ripe, sweet, peppery, deep red fruits with licorice, spice, jam and black cherries that keeps on coming. It is hard to believe this is almost 20 years of age. It seems immortal. Plums, kirsch, pepper, garrigue, licorice and spice aromas are easy to find. Soft in texture with a lush character, this forward style of wine has been a pleasure to taste since the day it hit the stores. This bottle seems slightly more advanced than previous bottles. I'm not sure if that is just this bottle, or if the wine is developing at a rapid pace for Pegau. I'll try and pop another in the near future. This stunner is packed with earthy, blackberries, cherries, garrigue, pepper, kirsch and licorice. Full bodied, long, sweet, ripe and intense, the pure, sweet, ripe fruits in the finish really stay with you. 1998 Pegau da Capo made from mostly old vine Grenache is so deep in color, it could pass for a 2007. With a nose packed with pepper, over ripe cherries, licorice, liquefied steak, garrigue, kirsch, spice, earth and fresh herbs, it's almost too much of a good thing. Please note I said, almost too much. Packed and stacked with multiple layers of sweet, jammy berries, the wine is obviously built to age and evolve for decades. The levels of concentration are almost off the charts. Perhaps I caught it at the wrong the wrong time, because the tannins were slightly obtrusive and the wine was not as expressive in the nose or mouth as I would have anticipated. From memory, the few times I've tasted the wine in the past offered a better tasting experience. I hope to try another bottle in another 5- 10 years. Concentrated and freakishly ripe fruit. Peppery jam, this is incredibly rich and dense. Lovers of Chateauneuf need to to experience this wine at least once. The finish is well over sixty seconds! Complex notes of black fruits, pepper, spices, griotte and jam. Rich, deep and palate pleasing. More structure, complexity, depth and fruit than the Reserve. Hello Mr. Ed! You need a bath because you stink like a barn. This wine, or at least this bottle was very horsey. There was good quality to the fruit and texture, but the barnyard aromas bordered on the edge of too much. Strawberry jam, kirsch, earth, Provencal herbs and pepper scents open to a medium/full bodied, round, ripe, sweet, mature Chateauneuf du Pape that is drinking great today. Full bodied, luscious and lusty, there is a lot to like in the wine and the best part is, there is no reason to delay popping a cork as it's drinking great today. The wine opens with sweet kirsch, cherry, pepper, underbrush and black raspberry jam. This fresh, full bodied Chateauneuf seems to have matured quickly for Pegau. The wine finishes with a soft, jammy, pepper and cherry filled finish. Cherry girotte, wild strawberry jam, fresh market herbs, underbrush, fennel and cracked black pepper start off the perfume. Full bodied, and filled with ripe, spicy, black cherry preserves, this sauvage style of Chateauneuf drinks well today and might improve a bit, but it's so much funto taste now, why wait? Traditionally styled with ripe, red fruit, herbs, licorice and pepper. Concentrated with rich textures, this ripe wine packs a lot of ripe kirsch in the finish. Animalistic, sauvage notes of ripe dark cherry and black raspberry jam with herbs and blackberry liqueur. Tannic, structured and slightly pitched. Needs time. Lacks some charm. Beautiful in every sense of the word. The sweet, decadently ripe cherries, black raspberries, strawberry jam, spice and earth, along with the texture that only comes from the patina of age were in full force with this bottle. Popped and poured, this was a stunner. Showing its age in color, with a boatload of roasted fruit, cherries, kirsch and earthy, forest scents, the wine is supple, round and fresh, with a beautiful core of sweet, ripe, spicy, black cherries that really leave a lasting impression. This was tasted from a pristine bottle at the property. With an expressive nose of black cherry liqueur, kirsch, pepper, herbs and stone, we were in Chateauneuf du Pape. With beautiful textures and a sweetness to the fruit, this full mature Chateauneuf du Pape is a candidate for serious aging as it’s still going strong at 22. Spice, kirsch, black pepper, earth and garrigue scents open a full bodied, Grenache based wine that's filled with sweet, strawberry jam, spice and fresh cherries. Fully mature, this Chateauneuf du Pape should offer pleasure for another 5-10 years. Kirsch, iodine, herbs, olives, licorice, sweet black and red fruit are intoxicating to smell in this sublime Chateauneuf du Pape wine. In the mouth, layers of juicy, sweet, ripe fruit fill every nook and cranny of your plalate with layers of ripe srawberry, cherry and a hint of licorice. Deeply colored with a potent perfume of spicy red and black fruit with jam. Very concentrated. Packed and stacked with ripe fruit and purity. The long clean finish will put a smile on any Chateauneuf du Pape fans face. The finish showed a slight, dry, tart cherry flavor. I think this wine is starting to dry out. Owners should drink this sooner than later. The 90 Reserve is a much better wine. Thick, beefy, dense and chewy in style with lots of herbs, strawberry, barnyard and black fruit on the nose. Herbs, Spices, jammy fruit and incense notes filled the glass. The mouth feel on the Laurence was very elegant and in a wild way, as it is a Chateauneuf, elegant. Deep, rich tiers of decadent fruit fill your palate. Sharp, peppery, bright and with a touch of brett, the wine lacks softness, leaving you with an earthy, chalky, spicy, red berry finish. Strong, barn yard odors greeted you at the door. With time, that blew off and it morphed into a beefy, rustic, traditionally styled Chateauneuf lacking some charm.